The actress Ellen Richter caused a sensation as a leading actress in action movies from the middle of the 10's. She conquered the audience in no time with movies like "Das Gesetz der Mine" (15), "Der Ring des Schicksals" (16), "Der Spion" (17), "Der Flieger von Görz" (18), "Der Fluch des Spiels" (18) and "Ein Schritt vom Wege" (18), and she became a competitor of the action star Harry Piel. Ellen Richter soon took the liberty of founding her own production company because of her enoumous success and she shot movies tailored to her. She soon had the reputation that each of her movies alway contained an expensive excursion to abroad. She was able to hold her popularity upright in the 20's. She appeared in movies like "Lola Montez, die Tänzerin des Königs" (22), "Der Flug um den Erdball" (25), "Moral" (28) and "Die Frau ohne Nerven" (29). The arise of the sound film finished her career. She played in the movies like "Die Abenteurerin von Tunis" (31) and "Das Geheimnis von Johann Orth" (32) in the 30's before she did not get any other jobs because she was a Jew. In 1938 she went to France and two years later she went to the USA via Portugal. 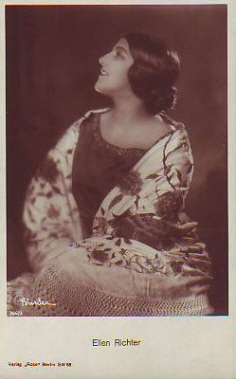 Ellen Richter was married with director Willi Wolff (1883-1947).